Fuel-efficient stoves use significantly less firewood than a traditional three-stone stove. This woman in Myanmar is using a pipe to help increase the fire's flames to cook the food. Winter is setting in in the Pacific Northwest and that means the smell of wood smoke is in the air. 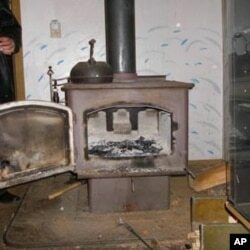 For a small percentage of Americans, a wood stove is their only source of heat. For many more, that crackling fire cuts the chill without running up the utility bill. But the smoke could be making the neighbors sick. For people like Patty Conelly of Pierce County, Washington, who has asthma, going outside in winter can make her throat constrict, seize up and choke. "I wish that they would cut down on some of the wood burning in Pierce County and all over," she says. "It would certainly help a lot." Conelly is one of dozens of people to vent on the public comment line at the Puget Sound Clean Air Agency. The agency also hears from people who say now is not the time to crack down on wood stoves. Old-style wood stoves like this one can still be found in U.S. homes. "Particularly during this current economic downturn, any new rules about burning wood would impose an undue hardship and a disproportionate burden financially and realistically in a very physical sense," one caller says. Another adds, "Probably you guys need to get me a job and pay my electric bill so I don't have to burn the wood. That's my idea." More than a century after the advent of heating oil and electricity, billions of people worldwide still heat and cook with wood fires. Even in a developed country like the United States, tens of thousands of people light wood stoves and fireplaces for comfort in the chilly months. However, residential wood stoves are the biggest source of winter air pollution in some parts of New England and the American West. In the developing world, indoor air pollution from smoke is blamed for up to two million deaths per year. For two decades, federal, state and local agencies have been trying to curtail smoke from older, highly polluting wood stoves and fireplace inserts. The tiny soot particles raise the most concern on calm winter days when the air stagnates. "Those levels build up when we have an inversion. They can cause lung issues. They can cause heart attacks, strokes," says Craig Kenworthy, who directs the Puget Sound Clean Air Agency. A clean, efficient cookstove designed for low-cost manufacturing in Africa. His agency and others offer rebates and other financial incentives to rip out a wood stove and install a cleaner heat source such as a gas or oil furnace. But progress is painfully slow. "We've changed out 1,200 of the older, more polluting devices in the Tacoma-Pierce County area," says Craig Kenworthy. "There are 24,000 of them still in the area. So that gives you some sense of the scale. You really have a scale question of needing to move forward and having a greater emphasis on getting to those cleaner devices." In other words, stiffer measures are needed. In the area where Kenworthy works, this year the incentives for stove upgrades more than doubled to get wood burners to switch to natural gas or electric heat. Meanwhile, neighboring Oregon has become the first state in the nation to require home sellers to remove the older, polluting kind of wood stoves when a home is sold. Fairbanks, Alaska, is another place that knows about bad air in winter. It's trying a low-tech solution: a firewood exchange. Bring in a cord of wet wood and you can go home with a cord of cleaner burning dry wood. Simultaneously, social entrepreneurs from the western U.S. and elsewhere are trying to clear the air in developing nations. Peter Scott founded the non-profit BURN Design Lab near Seattle. "You know, even a bad day in the Pacific Northwest is nothing like a good day in Africa, what people are exposed to there. Maybe this will give people a hint: imagine if you didn't have a chimney in your house and you were supposed to live in that smoke." In Scott's workshop, engineers and metalsmiths tinker with different cookstove designs. They're mostly compact and portable. Some are optimized to burn charcoal; others - wood, coal, or even animal dung. 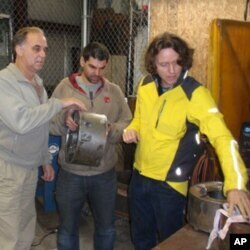 "We want to make a stove that uses 50 percent less fuel and produces 90 percent less emissions. We want to do that without a fan or any sort of complicated system. To make a stove for $20 or $25 that's affordable for someone in Africa, that's a real challenge." According to Scott, his design lab and others are close enough to those goals to move into mass manufacturing. 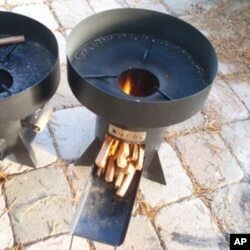 Scott's non-profit has joined a relatively new initiative called the Global Alliance for Clean Cookstoves. It's led by the United Nations Foundation. The alliance's director, Radha Muthiah, says cookstoves are gaining attention because the movement addresses a host of timely public concerns. "So one intervention can address health issues, environmental issues, gender and power-related issues in households, as well as economic livelihood issues. That is very attractive now." Muthiah can also distill it to a simple motto, "Cooking shouldn't kill." The alliance has recruited some celebrities, including the actress Julia Roberts and U.S. Secretary of State Hillary Clinton, to help build awareness. Muthiah also pays attention to market barriers such as affordability. "Even though the price points of these cookstoves has come down, we do still see them in the $25 to $50 range. That is still out of reach of some of these communities that these cookstoves would definitely benefit and impact." A number of non-profits have discovered a way to solve that stubborn cost issue: subsidize distribution of clean cookstoves with carbon credits. That means big industries in the First World pay to offset their pollution by supporting clean air and reforestation projects elsewhere on the globe.